Do you ever analyse your business? Do you know what your business strengths and weaknesses are? Do you know of any external threats to your business? Do you assess potential opportunities for your business? If you answered no to any of these questions you should consider performing SWOT analysis on your business. 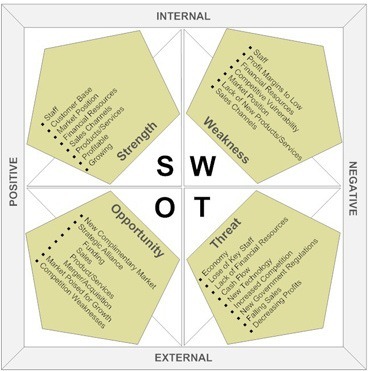 SWOT analysis (Strength's, Weaknesses, Opportunities and Threats) is a method of assessing a business. By undertaking the SWOT process you'll have a better understanding of your business and your market place. You'll discover what you do well, what you need to improve, whether there are potential opportunities you could take advantage of as well as potential external threats. Start by using a grid with four columns, one each for strengths, weaknesses, opportunities and threats. Objectively look at every aspect of your business and its products and services with your team, try to look at the big picture rather than concentrating on minutiae. Encourage the team to analyse your business and categorise what you do into the four columns. Examples might include a poorly structured website, low ranking in search engines compared to your competitors and low profit margins. Evaluate your strengths and compare them to your competitors. Ask yourself whether there are improvements to be made. Identify where expertise is lacking and what would be needed to fill the gap, also consider how you might turn your weaknesses around creating new opportunities. Try to be totally honest and realistic. It sometimes helps to get an outsiders’ viewpoint on your business strengths and weaknesses. Analyse the threats to your business. Try to come up with a "what if" plan to deal with potential threats. This will mean you'll be able to react quicker should any of the threats become reality, since you would have already considered what you might do if such an outcome materialised. Finally, try to learn from the outcome of your SWOT analysis, plan to build on your strengths, reduce your weaknesses and minimise the risks to your business. Be proactive and plan to integrate SWOT analysis into your business strategy and perform it at regular intervals to react to changing business conditions. There are even Pay as You Go services that enable you to set-up services with very little outlay and no monthly subscriptions or contracts to sign. Pay as You Go services like these enable small businesses or even freelancers to enjoy services similar to those of much larger organisations. We have been trialling one such Pay as You Go service called Answer.co.uk for a couple of months now which is a no frills message taking service provided by Internet Communications Limited and it has proved to be very professional and cost effective. If you run a UK based business find out more about the Answer.co.uk message taking service, or watch the video tour. If you are looking more for control over how your business calls are handled such as patching calls through to your landline or mobile phone then another service you should consider is Pure Jam. Like Answer.co.uk this service also doesn't have a set-up fee, but you are charged per minute when calls are patched through to your landline or mobile. There are a number of monthly tariffs available starting at £25 with no inclusive patched call time, with more expensive tariffs including lower call rates and inclusive patched call minutes. The receptionist will decide whether to patch a call to you or take a message depending on your current status or schedule. If you are available and want to take your own messages, then this is free. You can quickly change your status by text message or using Twitter. Pure Jam also has a mobile version of the message inbox to allow you to browse your messages while away from the office. Find out more about Pure Jam Virtual Receptionist service.